Crystalline Energy... An Ascension Trigger? Crystalline Energy… An Ascension Trigger? With Archangel Metatron, channeled by Melanie Beckler. Greetings, I Archangel Metatron and I am pleased to connect with you now. Understand that you are experiencing a period of the opening of cosmic intelligence, a portal of love. I want to talk more about what this means. And in order to do so, I want to cover a bit of history about your planet. Remember, as you read these words, shift your awareness into your heart, and allow your heart to open, for with this message comes frequency, cleansing you and lifting you so that you might experience the higher realms. I'm very present with you here and now as you read these words. Feel this presence within your heart. Yes, I am lifting your energy now. So about your Earth. Your planet as it exists now is in a state of duality. Polar opposites. Linear, time and space. And while this offers you a tremendous opportunity to learn lessons, to practice compassion, and to grow, your planet was not always in this vibration. There was a time when planet Earth existed in a non-duality atmosphere, when Earth was surrounded with a crystalline shield. Electromagnetic, magnetic and crystalline energy surrounded your Earth, assisting everything within this shield to vibrate with unconditional love and peace and compassion, with understanding. Cooperation, co-creation, and love were experienced and celebrated by all beings. And then, there was a great conflict. And in this conflict, the shield was shattered, fragmented and instead of remaining around, the energy entered into your earth. The magnetic fields separated and formed what you now know as magnetic poles on your globe. The crystalline energy entered into the Earth deep into the minerals, the rock, and of course the crystals where it has been held in pieces for centuries and beyond. The long standing duality on planet Earth has offered great opportunities to learn and to grow. Opportunities for you to learn about yourself, and your ability to transcend duality and negative experiences. As a collective and as an Earth, you are approaching the time when you will be ready to return to the crystalline energy of love and of light. 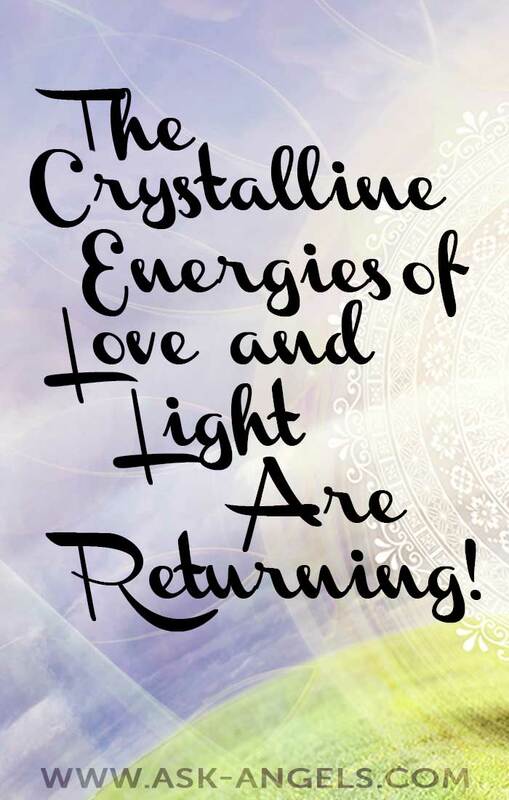 The crystalline energies of love and light are being released now from within the earth, and from the higher realms of spirit. There is an opening, an energy gate, and there will be more. As a part of the divine blueprint for your world, peaking on the progressing equinoxes, these crystalline energies that have lain dormant for so long are being activated. This combined with more and more light flooding your planet is really stirring things up. It is exciting, yes. It is good and it is opening you, and opening the possibility for you to return to a non-duality experience. I will call this your post-graduate work. You are approaching your graduation of the school of linear thought and of duality on Earth. You are moving in to zero point. Unconditional love. Unity. Full knowledge of your complete and total connection with all that is. This is exciting, yes? This is what you are moving towards. And this is what this energy activation that continues to appear in waves, is all about. But it's not shall we say, easy. With great amounts of light, and crystalline energy flooding your planet, anything that is not in alignment with love, and with your Higher Self is rising up to the surface. This is happening within individuals, within businesses and within unique personalities. That which is not love is bubbling up to the surface for release, and in most cases, it's not pretty! Think for a moment about your day today, and allow yourself to feel the underlying emotions that were present. If there were challenging experiences and emotions that came up for you, even more so, allow yourself to experience these now. Remember that when you are desiring to release something, the first step is to feel it. Allow yourself to be present with the emotion, allow the emotion to be present with you. Its natural to want to bury it, or to push it away. This is what has been done in the past, and this is why it is needing to be dealt with right now. And so I tell you now, that if you don't deal with it now, as the energies continue to rise and reach new heights and peaks, it could be overwhelming. Perhaps you already feel overwhelmed? So now release anything that does not serve you into the light, replacing it with unconditional love and compassion. I want to point out that with these changes continuing to unfold, you are able to effortlessly ride this wave of light. You are able to navigate the continued surges of energies coming into your earth, by using your spiritual tools, using meditation, using release, and using affirmations. 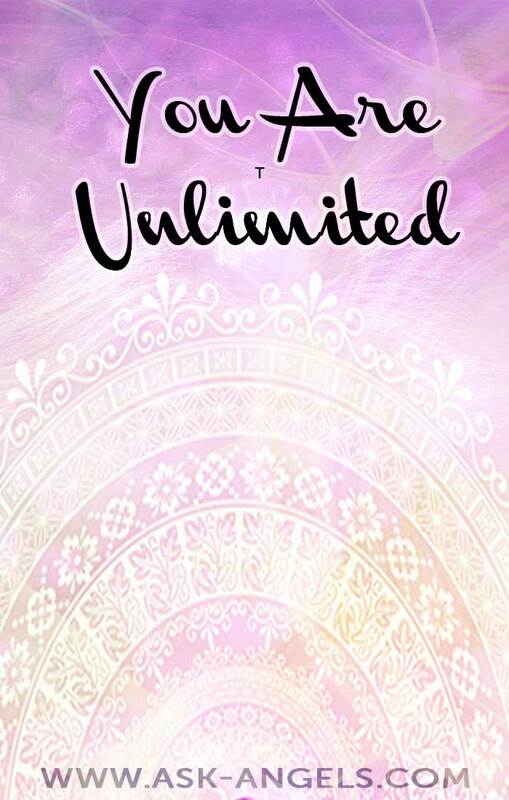 With this you will be able to stay in a positive vibration and actually increase your frequency, expand your aura, and become closer, more connected to your higher self. Your Divine self. 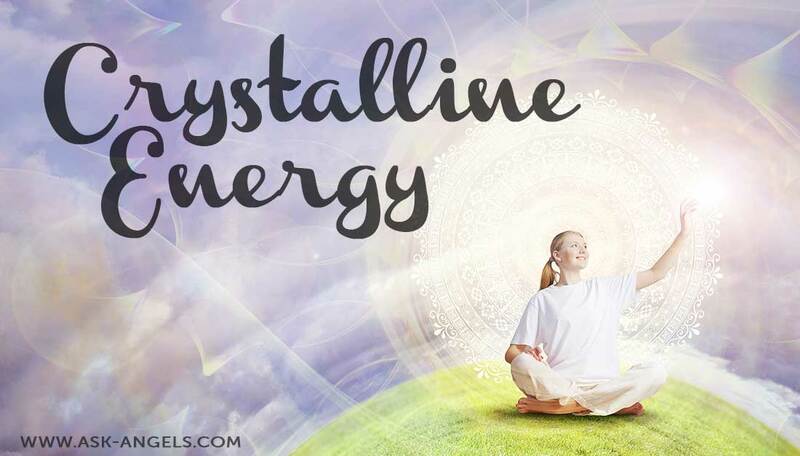 The elevating energy and return of crystalline light and consciousness is a wonderful opportunity for you to build your light body, to strengthen your aura and to infuse your being with the twelfth dimensional crystalline energy that has been dormant since times of Atlantis on your Earth. You Have Long Waiting For This Energy That Is Finally Here. Masters, you have waited long for this activation of energy, and truly, it is here. Now, with this energy returning you have a calling. You now know what is going on, and there are many on your earth who do not. I want you to know, that you are being called now to work. To serve, to reach out towards others, to hold their hand. You are being called to be an encourager and a way shower. Helping others, encouraging them, and loving them. Help others to navigate through this energetic time. If they are not open, just love. Send them a silent blessing, a simple prayer, a smile. Consciously send love energy. You can easily do this and it is very, very powerful for you to do so. In addition, set the intention and make the commitment to stay positive yourself. Stand in the light, stay in the energy of love, and maintain your link with the Divine and angelic realms. 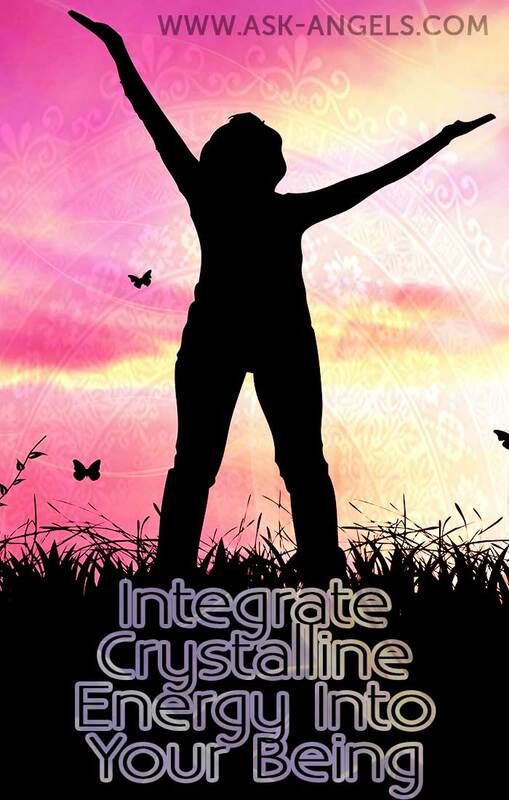 Integrate Crystalline Energy Into Your Being. To support you now, I wish to lead an exercise in integrating this energy into your being. As you read, allow crystalline energy to come into your present time and space. Allowing it to flow into your energy, through you, and out of you returning to the infinite universe, the energy of unconditional love and compassion. Crystalline light energy is now above your head. You may see or become aware of light, of a golden light orb, a tetrahedron star of light hovering above you. And out from within this star orb of crystalline light, the energy of activation begins to pour down upon you. Light flowing in you through your crown chakra, filling your spinal column in a pillar of light. Cleansing and uplifting your chakras. 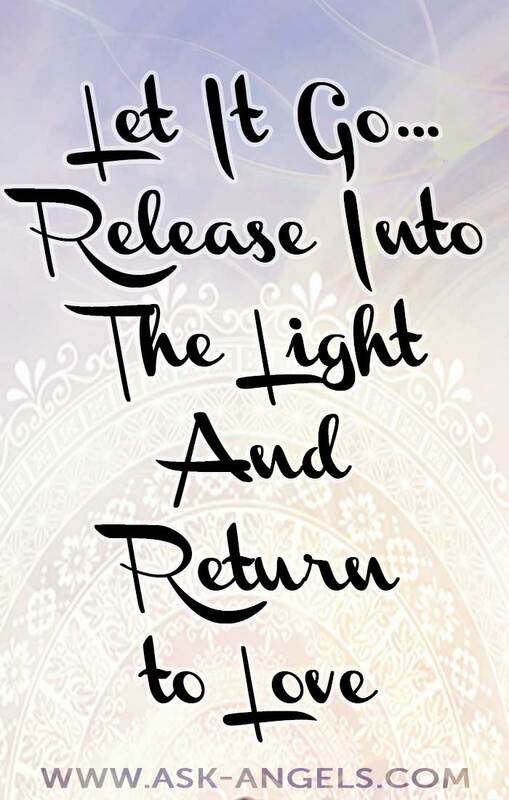 Releasing negativity into the light, and returning your inner being to a state of love, a state of balance. Breathe in pure white light, and now on your out breath, see it leave from your heart, reaching across your planet, and even more, reaching across the universe. A wave of unconditional love flowing forth that matches the wave coming in. We now send this wave of love together. Love flows… And truly dear one, you have no idea how powerful this is. How bright the light you are shining, really is. Those who are unconscious still have an opportunity to wake up, and you can help by flowing love, by focusing on being love, by living your Truth. I want to point out another opportunity you have, and that is clearly defining for yourself what you want. In powerful energy times, you have an opportunity for great change. This is the case now. Where in your life do you have experiences that no longer serve you? Instead of dwelling on those experiences, focus on how things can improve in the new energy. How can you serve others in the new energy? Begin to define this for yourself, how you will serve. Ask your guides and angels to help you to fill in any gaps in the vision you are beginning to tune into, for how you can align with true bliss, love and fulfillment in you life. And experience this. Feel this, imagine this. The increase in light energy on Earth is strengthening your connection to your inner being. The veil is being lifted even more. You truly have access to infinite intelligence now. You access it within your heart, by looking within, by opening your heart. By choosing love and compassion and joy. Allowing your past to be revealed to you, one step at a time. Your next step, your step now, is effectively using the opening at this time. Use the energies that are being activated and released onto Earth now to your benefit. Remember who you really are, and release the things within you that no longer serve you. It is only your subconscious thought, your outdated belief systems, and your negative emotions that are preventing you from truly being unlimited. Joyful, loving, abundant, peaceful, true, glamorous, compassionate, beautiful, adventurous, inspiring, devoted, Divine. This is you. Return to this, and use these energies. Now, today is only the start. The energy will continue to build and will continue to activate and unfold. Remember to release challenging emotions that come up for you into the light. Remember to send love and send compassion to all whom you encounter, especially those who push your buttons. Especially those who are challenging, or rude, or mean. I will be with you throughout every step of the way. Call upon me, Archangel Metatron. I invite you to consciously connect with me again at the time of the equinox and peak of energies where we will gather, enjoy and in love, magnify this energy across the world so that your world may return to the vibration of OM. Peace. It is within you. And as you know your inner world creates your outer world, so as you live peace, so shall your world be. You are deeply, deeply loved by all in the realms above and I encourage you to love yourself throughout this process. You can do it, and herein lies a great opportunity. At this time, I shall pass in one sense, and in another, I am always by your side, a thought away. Simply think Archangel Metatron and I am with you. This channeled message with Metatron is copyrighted, but you have my permission to share as long as you cite Melanie Beckler as the author and include a working link to this page from your post. I loved this Equinox Insight with Archangel Metatron. Thank you so much for your inspiration and love. I can only hope and Pray Melanie sees this message. I am undoubtedly going through what she’s writing about. And I’d love nothing more than to have a 1 on 1 with her. I need someone with her wisdom to help advise me. I have an extraordinary amount of potential, I just need some ideas on how to apply it. Thanks and God Bless! WOW! Thank you for that powerful message, and the tools to help us. As I read it, and even still NOW, I’m feeling this tingling down the back of my neck, down my whole body, just tingles, AND I FEEL the love. This is amazing as I have been suffering miserably since the end of 2009. I think I was TRYING to awaken. Only, I wasn’t allowing it to flow, I was basically working against it. I think I’m gonna be ok now. I feel it, lol… and it’s coming in these really strong waves of joy, happiness (which I haven’t felt in a long time), and love. I was worried that my empathy had gotten lost somewhere, I remember worrying that my heart had hardened, and I couldn’t FEEL anymore. It’s definitely opened back up though! Thank you, a million times over – thank you! I wish I could explain this feeling. I just want EVERYONE to “get it”! I can’t wait to go back through your website and read the rest of your writings! Thank you Melanie. Parts of it rang so true for me. Could perfectly relate it to where I am at this point of time. Much gratitude for the confirmation. Have shared it on facebook and hope it reaches many more people. Bless you. With Love,,, Mr’s. Tina Marie Pierce (Anzaldua),Thank You Both for it all, Thank you Thank you again. Wow I had weird dream last night and was wondering what was going on. The emotions are just crazy right now. I am grateful that it is part of the release as I had been feeling great and light for a while until last night. Thank you for the guidance and reassurance. I am grateful for the release. I need help you to feel the angelic power. I have developed a strong feeling of love towards arch angel. I believe that the can build me up and win over all the evil battle I face today. I felt so much love as I was reading this from Archangel Metatron and it had so much information !! Thank you for sharing and thank you Archangel Metatron sending endless love !!! This explained today to me so well! Thank you Melanie. .and Metatron. I felt so strange today and found myself expressing things differently than I normally do. That felt good but also strange at the same time. Also I had a poweful dream in the afternoon when napping – I gave birth! I didn’t feel pain, but rather strong and determined. Then in the evening my friend uploaded a song in youtube. . I wrote it just before Christmas ( it just came to me – lyrics and melody. First time ever.. few lyrics yes but no melodies.) and now he made it into a video with me in it. Intense feelings, since the old perfectionist in me tried to emerge and tell me what should be differently in the video and at the same time my realisation of the power of the lyrics and that it needs to be just like that in this moment. Thank you. Love and light to all. So beautiful and needed today. Thank you, thank you, thank you! Much love! Thank you Melanie, this message/meditatiom was truly transformative. I send you love and blessings. Beautiful! Thank you for sharing your gifts, Melanie!